Lane College, in Jackson, Tennessee will be the site of the November 2017 Supreme Court Advancing Legal Education for Students (SCALES) project. Lane College, founded in 1882 by one of the nation’s early African American church denominations, is a small, private, co-educational institution that provides a liberal arts curriculum leading to baccalaureate degrees in the Arts and Sciences. "The SCALES Project is a tremendous learning tool for high school students," said Justice Roger Page. "I am very excited that it is coming to my hometown of Jackson. Dr. Logan Hampton is a dynamic leader in our community, and I look forward to watching what he accomplishes at Lane College during his tenure as president." The SCALES project is a Tennessee Supreme Court initiative designed to educate high school students about the judicial branch of government and gives students a unique opportunity to hear the oral arguments for an actual Supreme Court case in a nearby community. Earlier this year, the Tennessee Supreme Court was recognized for its SCALES Project as the 2016 recipient of the Sandra Day O’Connor Award for the Advancement of Civics Education. 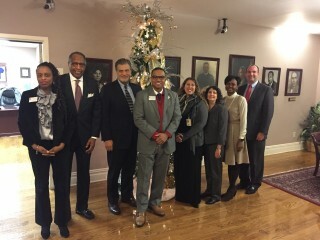 (from left to right) Dr. Michelle Stewart, Lane College; Peter Woolfolk, Communications Strategies; John Crawford, Education Manager-AOC; Dr. Logan Hampton, President of Lane College; Michelle Hardee, VP, Jackson-Madison County Bar Association, Mary Rose Zingale, Director of Court Services-AOC, Darlette Samuels, Lane College; Aaron Chaplin, President, Jackson-Madison County Bar Association.